The year was 1991, and Americans needed more sports cards. 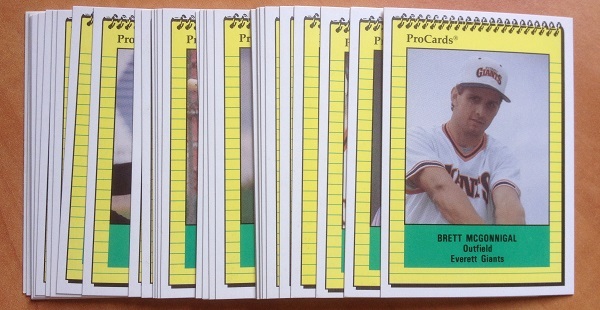 They’d ripped open all the Upper Deck foil they could find, pressed down on the translucent plastic of the Score packaging to read the faint name of the bottom card of each pack. They filled three-ring binders with Jeff George’s mustache and Dikembe Mutombo’s teeth, and even attempted to figure out what a Pavel Bure was. Still, it wasn’t enough. Impatient to sell the next big rookie card, companies followed the concept to its natural limit and invented the pre-rookie. They released thousand-card sets full of players no one had ever heard of. The process had been distilled to the point where a collector need only buy a pack of unrecognizable players, put them in the closet, and wait. It’s no small irony that an increasingly cynical hobby turned to youth for its speculation. In truth, there have always been minor league cards. These were generally confined to the merchandise booths of the local team stadium or the local gas station, a stack of grainy photographs sold as team sets. They were little more than a glorified program that kids could play with after they got sick of the game four innings in. It was one such set I found a while back, in an old familiar thrift store baggy, memorializing the nearby 1991 Everett Giants. These cardboard rectangles strain the edges of what it even is to be a baseball card. The design employs the timeless aesthetic of the yellow legal pad. Since most of the players were going into their first professional season, there are no baseball statistics to evaluate, only biographical info. The flavor text for Paul Eckard, team trainer, reads: “Paul is the Trainer for the Everett Giants, Northwest League affiliate of the San Francisco Giants.” The photographs all come from a single sunless practice, and portray the same theme: of young men playing a game, all serious, all hopeful. This dogged vivacity is accentuated by the condition of the cards: pristine, even after being discarded. Their sharp corners convey a sort of reverence so common in the junk wax era: these were baseball cards. They might be worth something. There are some world-class names in this little set, names worth poaching for your next novel. No work of fiction would be unimproved by an Eric Stonecipher or a Doug Vander Weele. The greatest name among them, Dax Xenos Jones, earned himself a quarter of a season in the majors as a defensive replacement in the outfield. He was one of five who got the call: Ken Grundt pitched three games for Boston with a 10.80 ERA. Frank Charles got seven plate appearances as an emergency catcher with the Astros, and justified the choice by getting three hits. Lou Pote toured the world as a competent spare reliever, pitching for the U.S., Japan, Mexico, Canada, and Cleveland over 21 years. The star of the set is undoubtedly the great William Van Landingham. Van Landingham, I need not remind you, is a notable human being. He finished seventh in the 1994 NL Rookie of the Year voting, is tied for the second-longest last name in baseball history, and is perhaps the most obscure player ever to appear on the (back) cover of a Beckett Baseball Card Magazine. So there’s the joke. This whole set embodies the silliness and excess of baseball card collecting in its prime, as well as the over-seriousness of the game itself. It represents the effort of the ProCards company to catalogue the meaningless efforts of relatively unimportant events, of people playing a game not particularly well, and the vanity of collectors to maintain and protect the memory of those events for their own selfish purposes. In the internet age, such flecks of dust are neatly hidden in the depths of search engines and Angelfire directories. In 1991, they took up 3.5″ by 2.5″ by 0.5″. And then, hunting for a few more gags to toss into this piece, I returned to the weary gaze of Michael “Moose” Adams, and found a glint among the dust. I moved to the Pacific Northwest in 1981, at the age of three. The following year, twenty-five miles up Highway 405, the Kirkland Little League team brought down a Taiwanese dynasty that had won 31 straight games and five consecutive titles. The story became a lighter, if somewhat purer, version of the Miracle on Ice, of American triumph in a still-dusky era. It’s strange that I’d never known this before; Seattle isn’t laden with championships. Moose Adams wasn’t the star of that team – that role was thrust upon twelve year-old Cory Webster. But Moose proved a valuable partner, pitching a two-hitter in the semis to help the team reach the big game. Moose was drafted in the 12th round by the Giants, but chose college. He came to regret the decision. Without a pitching coach, his mechanics and health suffered, and he went undrafted. The Giants signed him as an undrafted free agent and assigned him to their short-season Everett ballclub, just a few miles from home. A newspaper article at the time teems with optimism: he finally had a teacher, his arm felt fresh, his confidence restored. It was his chance to start over. He threw four innings and retired. He was the only member of the Kirkland Little League team to play professional ball. Baseball cards, in a harmless and even enjoyable way, are pretty dumb. 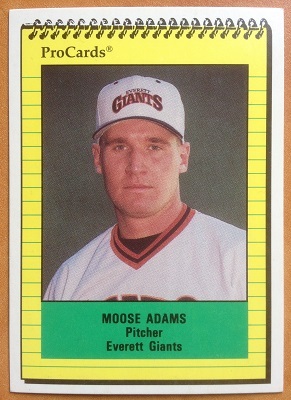 But it’s still kind of nice that Moose Adams got to be on one, once. We hoped you liked reading Little Giants by Patrick Dubuque! NotGraphs, in a harmless and even enjoyable way, is pretty dumb. But it’s still kind of nice. Well-written piece. If we are selecting lines for NotGraphs slogans as Mac has done, I suggest the following. If the same can be said about life, that it is excessive and over-serious, then NotGraphs is less dumb.